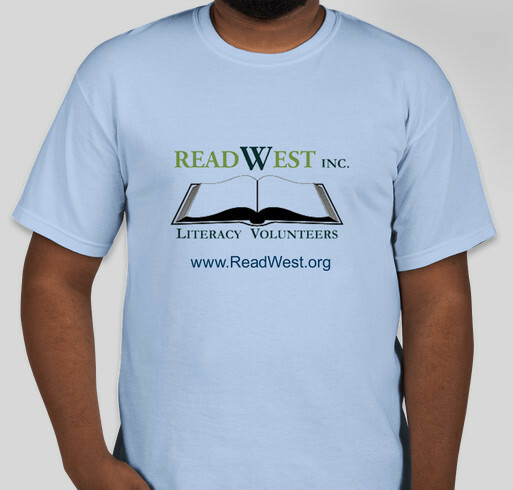 Buy a shirt to help support Adult Literacy learners! All funds raised will go directly to Readwest, Inc. .
Join our #GivingTuesdayNM campaign and help us raise funds to support our adult literacy programs. Did you know that 1 out of every 5 New Mexican adults reads below the 5th-grade level? For over 20 years ReadWest, Inc. has been housed in the Rio Rancho Jewish Center on Grande Ave. Recently our organization was asked to vacate the building so that it can be closed. The Rio Rancho Jewish Center had been extremely generous by charging a very modest monthly rent. While we have found a suitable facility the new rent is 3 times what we had been paying and, as with any move, there are also additional and unanticipated costs. However, YOU can help ensure that we are able to continue offering quality programs for adults who struggle to read. Providing a safe space for the student/tutor pairs to meet each week plays a crucial part in ReadWest’s success. Having tutors and students meet on site ensures that the experienced staff is available to help tutors find materials in the resource library. Additionally, meeting at a regular time and location helps the student focus on his/her learning. *Wanna do more? You can! Along with your shirt purchase, you also have the added option of applying a separate monetary donation that can be added to the total proceeds from this effort. Readwest is changing lives in New Mexico and I and to help them do it. ReadWest's volunteer Tutors help adults in Rio Rancho, Bernalillo and NW Albuquerque improve their reading, writing, math and computer skills. In turn, these adult students improve their own lives and those of their families. Adult Literacy changes lives! ReadWest Volunteers provide a critical service in our area by helping adults improve their reading and writing. I'm buying a shirt to show my appreciation! This is an amazing organization that is truly making a difference in our community. I have seen first hand how tutoring adults to read has changed their lives, and the lives of their children and families. ReadWest is a great organization with amazing volunteers who help people improve their lives. Share Why You Support "ReadWest Adult Literacy"